The KCB will giving out eight Samsung S7 phone s to eight lucky customers transacting using the KCB App starting 1st August through to 17th August 2016. The campaign happening courtesy of UleMsee2016,the KCB Mtaani Ambassador,will see a lucky customer rewarded each week. Read the terms and conditions below and good luck already from Loans Kenya! 1. Campaign Period: The campaign will begin on 1st August 2016 and end on 17th October 2016 ("Campaign Period"). 2. Eligibility: The campaign is open to KCB Bank Customers who download and transact with the KCB App. 3. How to Participate in the Campaign: To participate one must first DOWNLOAD the KCB App from your mobile App store and activate Mobile banking. One will then need to participate in our weekly challenges which are centered on specific transactions. 4. Winners: We will have one winner each week; starting 1st August 2016 to 17th October 2016. 5. Prizes: The weekly prize for each of the winners is a brand new Samsung Galaxy S7. They will then be announced the following week’ Monday post the challenge. 6. Notification to Winner: Winners names will be posted on our official Facebook Page and Twitter Handle. 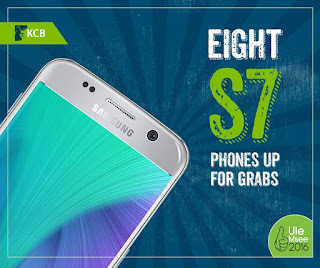 They will then receive a phone call from KCB’s official customer care numbers: 0711087 000 or 0732187000 with instructions on when and where to collect their reward. 7. Winner Selection: KCB will select a mystery day every week when Customers will be required to use a particular service on the KCB App. For example; The 100th person to use the service on this Mystery day will be the winner. This selection is final. 8. Other terms and conditions: KCB reserves the right to verify the validity of entries and to disqualify any entrant with viable cause. The prize is non-transferable and no cash or other alternative shall be offered for the prize. By accepting the prize, you will be deemed to have granted KCB the right to use and publish your name and picture in such media as KCB may choose (including but not limited to the internet) for advertising and promotional purposes without additional consent. KCB reserves the right to suspend or terminate the Campaign or amend these terms and conditions at any time for any technical or commercial reason. Any amendment to these terms and conditions will be published on the KCB Group website www.kcbbankgroup.com and on our official social media pages. KCB Group employees, Squad Digital Employees, Kocela Limited Employees and any other partner, supplier or third party directly involved with the facilitation of this Campaign and their immediate families and dependents are not eligible to participate in this promotion. Each prize winner will be required to declare or affirm in the Form of Discharge that they do not belong to any of the restricted groups of persons. Our social media policy applies.